On the June 30 edition of “Conversations” at 10 p.m., author Ed Meek is joined by fellow journalist, historian and University of Mississippi Professor Curtis Wilkie to talk about the tumultuous 60s when James Meredith became the first African American to enroll at Ole Miss. The event sparked dangerous campus riots, captured in Meek’s photographs and compiled in his book, “RIOT: Witness to Anger and Change.” A filmed interview with James Meredith discussing the 1966 March Against Fear is included in tonight’s program. On Sept. 30, 1962, when a student demonstration in the Circle protesting the admission of James Meredith turned violent, Meek, a 22-year-old graduate of Ole Miss and staff photographer for University Public Relations, was first at the scene. He stayed up all night and took over 500 photos including exclusive shots of Meredith in the classroom. Meek is the only photographer with a full body of work before, during and after the 1962 riot at the University of Mississippi. While Meek was in the middle of the action taking pictures, diving for cover, changing film in a cloud of tear gas, Wilkie, also 22, braved the tear gas to witness the mindless destruction. 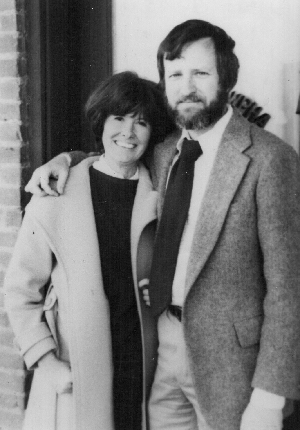 The rioting, which took the lives of French journalist Paul Guihard and bystander Ray Gunter, lasted until dawn when it was suppressed by Federal Marshals, the Mississippi National Guard and units of the U.S. Army and 101st Airborne. 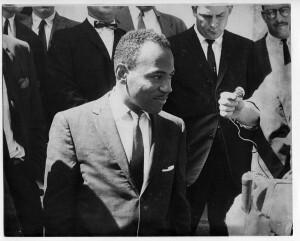 James Meredith registered for classes that day, becoming the first black student at Ole Miss. 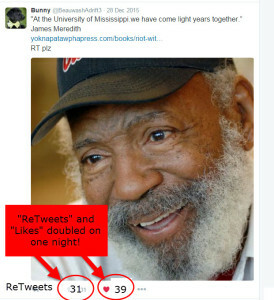 He graduated from Ole Miss in 1963. MPB’s “Conversations” interview with host Marshall Ramsey will air again on July 3 at 11:30.